This is a book that will be a shock to many students and trainees in psychology and psychiatry, for it shows how dangerous the machinery they are being inducted into actually is. And not only to beginners; it will confirm what many of us long suspected, that a psychological explanation for our distress is not much more progressive than the biological reductionist agendas of traditional psychiatry. Furthermore, the book deals with many of the attempts by psychotherapists and counsellors to play the game of their elders and betters in the psy complex. Here the argument of the book is more nuanced, and we are alerted both to the brutal physical abuse that psychiatry has historically visited upon those it claims to cure and to the need for a compassionate and therefore limited attempt to support those who are labelled as ‘mentally ill’. The limits are set by what is actually possible, and the work that a counsellor or psychotherapist is enjoined to carry out is one of empathic engagement. Numerous examples of this kind of work are offered in passing as we are led on a tour of the worst of psy practice. The book is an impassioned critique of that machinery grounded in clinical practice and in an impressive range of research resources. 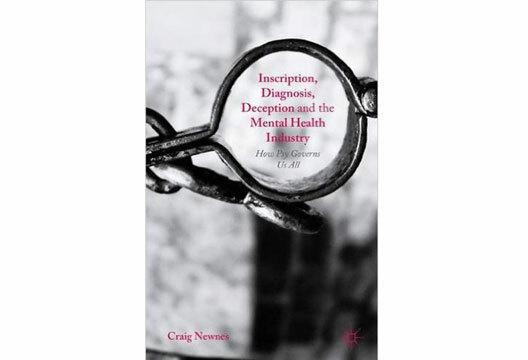 Newnes aims to demystify the ‘psy’ industry, and he does this by describing in a clear way the ways in which it has developed and the way it functions today. This is an academic and professional industry that is interlinked with the imperatives of capitalist society, and so the book attends not only to the powerful economic drivers for an increasingly pernicious individualisation of social problems but also to the economic forces that produce so much psychological misery in the first place. This is an unusual text in a number of respects, for it contextualises the debates in personal experience, many of which will resonate with the reader, whether they are practitioners, researchers or relatively new to what they might genuinely believe to be a ‘helping profession’. Theoretical frameworks are described to enable us to make sense of the wounds inflicted on patients, as is the way treatment mutates into assault. Here the book pursues a tightly argued agenda for critical participation and empowerment. The book contextualises the debates reflexively, that is to say, by allowing the reader into the process of knowledge-construction, to the writing of the book. This is by way of events that have a bearing on the arguments in the book and by way of curious tasting notes which tell us something about what substances were ingested or what music was playing as the text was keyed in. Something of the machinery of critique, financial and sensual, is thus laid bare as well as the apparatus of the psy complex that is the focus of the book. On the one hand, we are told how someone who is working in one of the ever-expanding psy professions might take seriously Newnes’s critique without losing heart; and it should be emphasised that this is an angry rather than a pessimistic book. It is cynical about the claims of psychiatry and psychology to make things better, but not about the attempts of critical psychiatrists and psychologists to challenge mainstream thinking and practice. On the other hand, we are able to see why attempts to ameliorate abuse can only be successful if they make alliances with those who use psychological services. Here Newnes also provides links to a range of organisations that bring together service users and critical professional allies. What will strike some readers is the multiplicity of critical alternatives, and it is clear that not all can be mentioned. This is a scholarly contribution that exposes, not for the first time but in a way that is accessible and enjoyable and up to date, how psychiatry and psychology works, the material conditions under which it has been formed and the forms of resistance that might be elaborated to combat it.